The primacy of Peter, also known as Petrine primacy (from Latin: Petrus, "Peter"), is the position of preeminence that is attributed to Saint Peter among the Twelve Apostles. It is to be distinguished from the primacy of the Bishop of Rome, also known as papal primacy or Roman primacy, whose link with the primacy of Peter is disputed. The Evangelical Dictionary of Theology illustrates the leading role that Peter played among the Apostles, speaking up on matters that concern them all, being called by Jesus by a name linking him with the rock on which Jesus would build his church, being charged with pasturing the flock of Christ, and taking the leading role in the initial church described in the Acts of the Apostles. There is general agreement among scholars on the preeminence that the historical Peter held among the disciples of Jesus, making him "the most prominent and influential member of the Twelve during Jesus' ministry and in the early Church". In one interpretation the prominence that the New Testament and other early Christian writings attribute to Peter is due to their seeing him as a unifying factor in contrast to other figures identified with disputed interpretations of Christianity. Controversy has surrounded one particular text that is linked with the Aramaic nickname name כפא (Cepha), meaning "rock," that Jesus gave the man previously known as Simon. [John 1:42] The Greeks translated it as Πέτρος (Petros), a new form, appropriately masculine, of the standard feminine word πέτρα (petra), also meaning "rock;" and the Latins translated it as Petrus. In the Greek text, the new name given is Πέτρος (Petros), and in the second half of the same verse the word translated as "rock" is πέτρα (petra). A literal translation, in the style of the King James Version, of the words presumably used by Jesus would be "Thou art Rock, and upon this rock will I build my church". To preserve a supposed pun, the Greek text chose to translate Peter's name as "Πέτρος" rather than as "Κηφᾶς" (Cephas). One common Protestant argument historically has been that the translation from the New Testament in Hebrew into Greek is tenuous at best as there is no real evidence or indication that the New Testament (in Greek) was ever translated from Hebrew or Aramaic texts, for that argument see Aramaic primacy. According to the Protestant transliteration argument, the language that Jesus spoke, the same word, כפא (cepha), was used for both Peter's name and for the rock on which Jesus said he would build his church. Since the Protestant Reformation, many non-Catholics, in disagreement with the historic Catholic Church view, have disputed whether the feminine πέτρα refers to Peter, claiming it instead refers to either Peter's confession of faith or Jesus himself. In Catholicism, it is argued that the primacy of Peter is a basis for the primacy of the bishop of Rome over other bishops throughout the Church via the doctrine of Apostolic succession. This extension of Petrine primacy to popes is known as the primacy of the Bishop of Rome, also known as the primacy of the Roman Pontiff. This Catholic Church doctrine holds that the papacy has authority delegated from Jesus to rule over the entire Church. There are various views on the nature of the primacy and how it has been exercised and passed on. This belief makes a distinction between the personal prestige of Peter and the supremacy of the office of pope which Catholics believe Jesus instituted in the person of Peter. Some, but not nearly all, Protestant denominations accept the concept of the primacy of Peter, but believe it was only relevant during the lifetime of Peter. They do not believe the pope holds any authority over the universal Church. Catholics believe that Saint Paul saw Judaism as the type or figure of Christianity: "Now all these things happened to [the Jews] in figure...."[1 Cor. 10:11] In the Old Law, Deut. 17:8-12 attributes to the High Priest the highest jurisdiction in religious matters. Therefore, it is argued, logic dictates that a supreme head would be necessary in the Christian Church, though the relevance of Biblical law in Christianity is still disputed, see also New Covenant and New Commandment. In the New Testament, which some call the New Law or "New Greek Testament", Matthew 16:16-18 reports that Jesus changed Simon's name to Peter. Elsewhere in Scripture such a name change always denotes some change in status (e.g., Abram to Abraham, Jacob to Israel, and Saul to Paul). Jesus also said to Peter in verse 19, "I will give to thee the keys of the kingdom of heaven." Especially for the Hebrew people, keys were a symbol of authority. Indeed, Jesus declares in the Book of Revelation, that He has the "keys of death and hell," which means that He has power over death and hell; Isaiah 22:21-22 also supports this. Cardinal Gibbons, in his book The Faith of Our Fathers, points out that keys are still a symbol of authority in today's culture; he uses the example of someone giving the keys of his house to another person, and that the latter represented the owner of the house in his absence. Another source indicating Peter's supremacy can be found in John 21:15-17 where Christ tells Peter three times to "feed His sheep" and "feed His lambs." The "sheep" are understood to be the stronger portion of Jesus' flock (the clergy), and the "lambs" are understood as the weaker portion (the laity). From this, Catholics believe that Peter was given charge over Christ's whole flock, that is, the Church. Moreover, Peter is always named first in all listings of the Apostles; Judas is invariably mentioned last. In Matthew 10:2 Peter is described as the "first Apostle". It is important to note that Peter was neither the first Apostle in age nor election; therefore, Peter must be the first Apostle in the sense of authority, if you ignore the possibility of him being first in the sense of first in the list of Twelve Apostles.[Mk. 3:16] [Mt. 4:18-19] According to Acts 1-2,10-11,15, St. Peter was the leader of the early Christian church in Jerusalem. Jesus also instructed St. Peter to strengthen his brethren, i.e., the apostles, according to Luke 22:31-32. Both Latin and Greek writers in the early church (such as the St. John Chrysostom) referred to "rock" as applying to both Peter personally and his faith symbolically, as well as seeing Christ's promise to apply more generally to his twelve apostles and the Church at large. 424 Moved by the grace of the Holy Spirit and drawn by the Father, we believe in Jesus and confess: 'You are the Christ, the Son of the living God.' 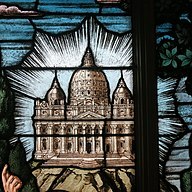 On the rock of this faith confessed by St. Peter, Christ built his Church. 552 Simon Peter holds the first place in the college of the Twelve; Jesus entrusted a unique mission to him. Through a revelation from the Father, Peter had confessed: "You are the Christ, the Son of the living God." Our Lord then declared to him: "You are Peter, and on this rock I will build my Church, and the gates of Hades will not prevail against it." Christ, the living Stone, thus assures his Church, built on Peter, of victory over the powers of death. Because of the faith he confessed Peter will remain the unshakable rock of the Church. His mission will be to keep this faith from every lapse and to strengthen his brothers in it. Regarding the Catholic interpretation of Matthew 16:18-19, Jaroslav Pelikan writes, "As Roman Catholic scholars now concede, the ancient Christian father Cyprian used it to prove the authority of the bishop—not merely of the Roman bishop, but of every bishop," referring to Maurice Bevenot's work on St. Cyprian. Eastern Catholics agree with the above, but also consider Peter to be representative of all bishops. In this, they represent a middle-ground between the Catholic position and that of the Eastern Orthodox in the next section. "The speech of St. James is of a different character [from that of St. Peter]. He acquiesces to what St. Peter had said, although it seems to have been against his personal inclinations, and then puts forward a practical suggestion for the sake of harmony." For Catholics, the fact that the new name for Simon is Peter is in fact itself very significant. In the Old Testament God is frequently referred to as a Rock or stone. Jesus refers to himself as the cornerstone. The Book of Daniel contains a prophecy that a Rock or stone from the mountain of God (heaven) will come down to earth and destroy the pagan kings. The rock will then grow itself until it covers the entire earth. Protestants consider this prophecy to allude to the end times but Catholics consider the prophecy to refer specifically to Jesus as the Rock from Heaven. Further, Catholics see the fact that the Rock does not leave but stays to until it covers the entire earth to mean that the Church, built of the Rock of Peter, is the body of Christ, the Rock from Heaven, and that the Rock will eventually cover the entire Earth which is why the term Catholic (universal or worldwide) is the most common designation for the Catholic Church. Irenaeus has been called the most important witness of the Christianity in the 2nd century. Taught by Polycarp, who had been instructed by John the apostle, Irenaeus became bishop of Lyons in 178. In his Against the Heresies, Irenaeus wrote, "Although there are many dialects in the world, the force of the tradition is one and the same. For the same faith is held and handed down by the churches established in the German states, the Spains, among the Celtic tribes, in the East, in Libya, and in the central portions of the world…" In Book 3, Irenaeus continues his defense of the unity of the church around the bishop, writing, "By pointing out the apostolic tradition and faith announced to mankind, which has been brought down to our time by successions of bishops, in the greatest, most ancient, and well known church, founded and established by the two most glorious apostles, Peter and Paul, at Rome, we can confound all who in any other way… gather more than they ought." Irenaeus asserted the Doctrine of Apostolic Succession to counter the claims of heretics, especially the Gnostics who were attacking the theology and authority of the mainstream Church. He stated that one could find true teaching in several leading episcopal sees, not just at Rome. The doctrine he asserted, therefore, has two parts: lineage from the Apostles and right teaching. Even today a bishop can be in the line of succession, but schismatic and heretical as is the case with many episcopi vagantes who claim to or may have Catholic Orders, but have no following and have deviated from the Catholic orthodox faith as defined by the larger denominations such as the Orthodox, Anglicans, Catholics and Lutherans. Born in Carthage around 155 AD, Tertullian became a priest around the age of forty and worked tirelessly to defend the faith. In his Scorpiace of 208 AD, Tertullian wrote, "No delay or inquest will meet Christians on the threshold… For though you think that heaven is still shut up, remember that the Lord left the keys of it to Peter here, and through him to the Church, which keys everyone will carry with him, if he has been questioned and made confession [of faith]." Scorpiace is the first known historical reference to the keys pertaining to anyone other than Peter. In it, he saw the keys as pertaining to "everyone" if they "made confession" rather than according to the modern interpretation concerning the bishops of Rome alone. Tertullian later retracted even this association in De Pudecitia, listing various reasons why the Keys of Peter pertained to Peter alone. The churches later declared him an apostate along with the followers of Montanus for insisting that authority must be associated with demonstrable power. John Chrysostom was born at Antioch around 347 and would fight for the reform of the church until his exile in 404. His homilies emphasize his belief in the primacy. St. Chrysostom called Peter "the leader of the choir, the mouth of all the apostles, the head of that tribe, the ruler of the whole world, the foundation of the Church, the ardent lover of Christ…" His writings also emphasize the mortality of Peter, linking him more closely to the people of the Church. Innocent I held the papal office from 402 to 417. Modern theories of Papal Primacy developed around Innocent and his writings. In a 416 AD letter to Decentius, bishop of Eugubium, Innocent writes, "Who does not know or observe that it [the church order] was delivered by Peter the chief of the apostles to the Roman church, and is kept until now, and ought to be retained by all, and that nothing ought to be imposed or introduced which has no authority, or seems to derive its precedents elsewhere?" It is also during this time that bishops began to recognize Innocent's primacy as Pope over other bishops in the West. This is made evident, among others, in a letter from the Council at Mileve to Innocent in 416 AD, which alludes the authority of "his holiness" drawn from the authority of Scripture. The doctrine of Primacy was beginning to take shape with Innocent's papacy. The Gregorian Reform movement was rather a series of movements many of which involved the reform of the Catholic Church, headed by Gregory VII, formerly the Archdeacon Hildebrand. Gregory became Pope in 1073 with the objective of reforming not the body of the church, but a purification of the clergy in general. Gregory is perhaps most recognized with the quarrel between himself and King Henry IV of Germany, known as the "Investiture Contest". Gregory's Dictus Pape outlines his policies and ideals, as well as those of the Catholic Church. In this work, Gregory claims that the pope has power to depose and restore bishops, and also effectively reduces the authority of other bishops. This doctrine supported the idea that Rome and the church here also afforded primacy over all other churches. Gregory's papacy also bolstered the power of the Church over that of the State. The Gregorians defended the ideal of a separation of powers, claiming "Let kings have what belongs to kings, and priests have what belongs to priests." The Petrine Primacy was now more affirmed than ever. Many challenges faced the Popes claiming primacy throughout the history of Catholicism. The Edict of Milan, the Council of Nicea, and the First Council of Constantinople all dealt with the issue of primacy in that they amended the power of the popes over the other bishops. The third canon of the First Council of Constantinople of 381 AD declares Constantinople the new Rome, gives the Bishop of Rome the seat of honor and gives the Bishop of Constantinople second place in honor. The Council of Ephesus in 431 AD offers debate as to whether the results determine that the Pope is at the head of the Church, or rather that it is under the authority of a council of bishops (Giles, 238-256 AD). Although the highlight of the Council of Chalcedon in 451 AD was the confession of the Person of Christ, the Council also resulted in limitations to the powers of the bishops. Many letters of the Council identify its position as in agreement with papal primacy. Those present employ titles such as "the most holy and beloved of God" and "ecumenical archbishop and patriarch of great Rome" to address Pope Leo. Thus, as not all can be satisfied with the results, The Council of Chalcedon resulted in a schism with the Oriental Orthodox Church. Internally, people questioned who rightfully was pope, while others wondered as to the role the Pope was to play outside of Rome. The papacy's most widely known crisis, as well as its largest challenge to authority, came with the "Great Western Schism" (also known as the "Papal Schism") in the late Middle Ages, dating from 1378-1417. Seven popes ruled from Avignon in France in the early 14th century, until Gregory XI risked returning to turbulent Italy and the Roman seat. Following the close of the Avignon papacy in 1377, Urban VI, an Italian, took the reins over a predominantly French college of Cardinals. The Cardinals called the election into question and elected Clement VII as Pope. Germany, Italy, England, and the rest of Northern and Eastern Europe remained loyal to Urban, while France, Spain, Scotland, and Rome followed Clement VII (1378–1394) and his successor, Benedict XIII (1394–1417) who would reside in Avignon. Icon of St. Peter (15th century, Russian State Museum, Saint Petersburg). The Eastern Orthodox Church regards the Apostle Peter, together with the Apostle Paul, as "preeminent apostles". Another title used for Peter is Coryphaeus, which could be translated as "Choir-director," or lead singer. Orthodox scholars follow St. John Chrysostom and the Byzantine tradition in seeing Peter as the icon of the episcopate with his title of protos (first) implying a certain level of authority over the other apostles. In this traditional Orthodox and Patristic view, the Church is the local Eucharistic assembly ("the diocese" in today's terminology) and the one who holds the "Chair of Peter" (St. Cyprian's expression) is the bishop. As a result, the primacy of Peter is relevant to the relationship between the bishop and the presbyters, not between the bishop of Rome and the other bishops who are all equally holding Peter's chair. A very clear patristic tradition sees the succession of Peter in the episcopal ministry. The doctrine of St Cyprian of Carthage on the "See of Peter" being present in every local Church, and not only in Rome, is well-known. It is also found in the East, among people who certainly never read the De unitate ecclesia of Cyprian, but who share its main idea, thus witnessing to it as part of the catholic tradition of the Church. St Gregory of Nyssa, for example, affirms that Christ "through Peter gave to the bishops the keys of the heavenly honors," and the author of the Areopagitica, when speaking of the "hierarchs" of the Church, refers immediately to the image of St Peter. A careful analysis of ecclesiastical literature both Eastern and Western, of the first millennium, including such documents as the lives of the saint, would certainly show that this tradition was a persistent one; and indeed it belongs to the essence of Christian ecclesiology to consider any local bishop to be the teacher of his flock and therefore to fulfill sacramentally, through apostolic succession, the office of the first true believer, Peter... There exists, however, another succession, equally recognized by Byzantine theologians, but only on the level of the analogy existing between the apostolic college and the episcopal college, this second succession being determined by the need for ecclesiastical order. Its limits are determined by the Councils, and - in the Byzantine practice – by the "very pious emperors." "Your most sweet Holiness has spoken much in your letter to me about the chair of Saint Peter, Prince of the apostles, saying that he himself now sits on it in the persons of his successors...Wherefore though there are many apostles, yet with regard to the principality itself the See of the Prince of the apostles alone has grown strong in authority, which in three places is the See of one...He himself stablished (sic) the See in which, though he was to leave it, he sat for seven years. Since then it is the See of one, and one See, over which by Divine authority three bishops now preside, whatever good I hear of you, this I impute to myself. " Consequently, Eastern and Oriental Orthodox do not recognize the Bishop of Rome as the unique successor of St. Peter and consider him to be in a state of schism and heresy. However, the Ecumenical Patriarch of Constantinople sends a delegation each year to Rome to participate in the celebration of the feast of Sts. Peter and Paul. The Orthodox also consider that St. Linus, not Peter, was actually the first Bishop of Rome. "Of the church of Rome, Linus the son of Claudia was the first, ordained by Paul; and Clemens (Clement), after Linus' death, the second, ordained by me Peter." "What, now, (has this to do) with the Church, and) your (church), indeed, Psychic? For, in accordance with the person of Peter, it is to spiritual men that this power will correspondently appertain, either to an apostle or else to a prophet." "For (John) the Son of thunder, the beloved of Christ, the pillar of the Churches throughout the world, who holds the keys of heaven, who drank the cup of Christ, and was baptized with His baptism, who lay upon his Master's bosom, with much confidence, this man now comes forward to us now"
"He has given, therefore, the keys to His Church, that whatsoever it should bind on earth might be bound in heaven, and whatsoever it should loose on earth might be, loosed in heaven; that is to say, that whosoever in the Church should not believe that his sins are remitted, they should not be remitted to him; but that whosoever should believe and should repent, and turn from his sins, should be saved by the same faith and repentance on the ground of which he is received into the bosom of the Church. For he who does not believe that his sins can be pardoned, falls into despair, and becomes worse as if no greater good remained for him than to be evil, when he has ceased to have faith in the results of his own repentance." "...Peter, the first of the apostles, receive the keys of the kingdom of heaven for the binding and loosing of sins; and for the same congregation of saints, in reference to the perfect repose in the bosom of that mysterious life to come did the evangelist John recline on the breast of Christ. For it is not the former alone but the whole Church, that bindeth and looseth sins; nor did the latter alone drink at the fountain of the Lord's breast, to emit again in preaching, of the Word in the beginning, God with God, and those other sublime truths regarding the divinity of Christ, and the Trinity and Unity of the whole Godhead." 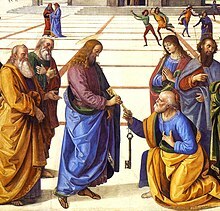 "...the keys that were given to the Church,"
"How the Church? Why, to her it was said, "To thee I will give the keys of the kingdom of heaven, and whatsoever thou shall loose on earth shall be loosed in heaven, and whatsoever thou shall bind on earth shall be bound in heaven." Moreover, Eastern Orthodox theologians follow such Fathers as St. John Chrysostom by clarifying that "rock" simultaneously refers to Peter (instrumentally) as well as Peter's confession of faith which is what has ultimate significance in establishing the Church. Some Orthodox scholars do not see Peter as being in any way above the other apostles, arguing that Peter did not have power and authority over them during Christ's public ministry. There were no positions of power between the twelve, only "degrees of intimacy" or "degrees of honor." According to this view, Peter has a weak symbolic primacy or primacy of honor (in the sense of a purely honorary primacy). In the patristic era, this was actually the Western view held by St Augustine. Others (see above), following the traditional Byzantine view of St John Chrysostom see Peter as the icon of the bishop and therefore endowed with authority in the Church (i.e. the diocese). "Come now, you who would indulge a better curiosity, if you would apply it to the business of your salvation, run over the apostolic churches, in which the very thrones of the apostles are still pre-eminent in their places, in which their own authentic writings are read, uttering the voice and representing the face of each of them severally. Achaia is very near you, (in which) you find Corinth. Since you are not far from Macedonia, you have Philippi; (and there too) you have the Thessalonians. Since you are able to cross to Asia, you get Ephesus. Since, moreover, you are close upon Italy, you have Rome, from which there comes even into our own hands the very authority (of apostles themselves). How happy is its church, on which apostles poured forth all their doctrine along with their blood! where Peter endures a passion like his Lord's! where Paul wins his crown in a death like John's where the Apostle John was first plunged, unhurt, into boiling oil, and thence remitted to his island-exile!" "Was anything withheld from the knowledge of Peter, who is called "the rock on which the church should be built," who also obtained "the keys of the kingdom of heaven," with the power of "loosing and binding in heaven and on earth?" Was anything, again, concealed from John, the Lord's most beloved disciple, who used to lean on His breast to whom alone the Lord pointed Judas out as the traitor, whom He commended to Mary as a son in His own stead?" "As a king sending forth governors, gives power to cast into prison and to deliver from it, so in sending these forth, Christ investeth them with the same power." "…though He has delegated the care of His sheep to many shepherds, yet He has not Himself abandoned the guardianship of His beloved flock." Other biblical texts seem to suggest that Peter was not head of the church in any de jure sense. Acts 15:1-21 shows the apostles considering a question by means of calling a Council. Although Peter is mentioned as speaking first, and all are silent - all are silent too when Paul speaks. Further if Peter's pronouncement was authoritative then Paul speaking afterwards would be superfluous; given that the 'decision' had already been made. Equality of all the Apostles is shown in Ephesians 2:19-20; that all the Apostles together are the foundation of the church. Galatians 2:7 shows that Paul taught in the same terms as Peter did. The forgiveness of sins (one of the powers of the keys) is granted to many John 20:23 and, Matthew 18:19. Orthodox historians also maintain that Rome's authority in the early Eastern Roman (or Byzantine) empire was recognized only partially because of Rome's Petrine character, and that this factor was not the decisive issue. Moreover, the Orthodox view is that Rome's privileges were not understood as an absolute power (i.e., the difference between primacy and supremacy). In the East, there were numerous "apostolic sees", Jerusalem being considered the "mother of all churches," and the bishop of Antioch could also claim the title of successor to Peter, being that Peter was the first bishop of Antioch. "Canon 28 of Chalcedon was for [the Byzantines] one of the essential texts for the organization of the Church: 'It is for right reasons that the accorded privileges to old Rome, for this city was the seat of the Emperor and the Senate.' ... The reason why the Roman Church had been accorded an incontestable precedence over all other apostolic churches was that its Petrine and Pauline 'apostolicity' was in fact added to the city's position as the capital city, and only the conjunction of both of these elements gave the Bishop of Rome the right to occupy the place of a primate in the Christian world with the consensus of all the churches." A major debate between Catholics and Protestants centers on Matthew 16:18 where Jesus tells Peter: "You are Peter, and on this rock I will build my Church...." Catholics interpret the verse as saying that Jesus would build his church on Peter, the apostle: Jesus told Peter (Rock) that he would build his Church on this Rock (Peter), and that Peter was made the shepherd of the apostolic flock[Jn 21:15-19]—hence their assertion of the Primacy of the Catholic Pontiff. Jesus gives Simon the new name petros. However he refers to the "rock" as petra. The inspired New Testament Scriptures were written in Greek, not Aramaic. What Jesus might have said in Aramaic is conjecture. In Greek, there is a distinction between the two words, πέτρα being a "rock" but πέτρος being a "small stone" or "pebble". (James G. McCarthy translates the two as "mass of rock" and "boulder or detached stone", respectively.) Jesus is not referring to Peter when talking about "this rock", but is in fact referring to Peter's confession of faith in the preceding verses. Jesus thus does not declare the primacy of Peter, but rather declares that his church will be built upon the foundation of the revelation of and confession of faith of Jesus as the Christ. Donald A. Carson III (Baptist and Professor of New Testament at Trinity Evangelical Seminary) states, "Although it is true that petros and petra can mean "stone" and "rock" respectively in earlier Greek, the distinction is largely confined to poetry. Moreover, the underlying Aramaic is in this case dubious at best; and most probably kepha was used in both clauses ("you are kepha" and "on this kepha"), since the word was used both for a name and for a "rock". The Peshitta (written in Syriac, a language cognate with Aramaic) makes no distinction between the words in the two clauses. The Greek makes the distinction between petros and petra simply because it is trying to preserve the pun, and in Greek the feminine petra could not very well serve as a masculine name." An alternate Protestant argument is that when Jesus said "upon this rock" in the aforementioned Matthew verse, he referred to himself, in reference to Deuteronomy 32:3-4, which states that "God...is the Rock, his work is perfect". This idea also appears in 1 Corinthians 10:4, which says "...that Rock is Christ." In Ephesians 2:20, Jesus is called "the chief cornerstone". In the original Greek the word translated as "Peter" is Πέτρος (Petros) and that translated as "rock" is πέτρα (petra), two words that, while not identical, give an impression of one of many times when Jesus used a play on words. Furthermore, since Jesus presumably spoke to Peter in their native Aramaic language, he would have used kepha in both instances. The Peshitta Text and the Old Syriac text use the word "kepha" for both "Peter" and "rock" in Matthew 16:18. John 1:42 says Jesus called Simon "Cephas", as does Paul in some letters. He was instructed by Christ to strengthen his brethren, i.e., the apostles. [Lk 22:31-32] Peter also had a leadership role in the early Christian church at Jerusalem according to The Acts of the Apostles chapters 1–2, 10–11, and 15. Protestant counter-claims to the Catholic interpretation are largely based on the difference between the Greek words translated "Rock" in the Matthean passage. In classical Attic Greek petros generally meant "pebble," while petra meant "boulder" or "cliff." Accordingly, taking Peter's name to mean "pebble," they argue that the "rock" in question cannot have been Peter, but something else, either Jesus himself, or the faith in Jesus that Peter had just professed. However, the New Testament was written in Koiné Greek, not Attic Greek, and some authorities say no significant difference existed between the meanings of petros and petra. Although Matthew 16 is used as a primary proof-text for the Catholic doctrine of Papal supremacy, Protestant scholars say that prior to the Reformation of the sixteenth century, Matthew 16 was very rarely used to support papal claims. 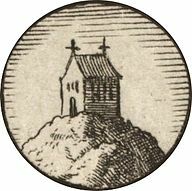 Their position is that most of the early and medieval Church interpreted the 'rock' as being a reference either to Christ or to Peter's faith, not Peter himself. They understand Jesus' remark to have been his affirmation of Peter's testimony that Jesus was the Son of God. Another rebuttal of the Catholic position is that if Peter really means the Rock which makes him the chief of Apostles, it would contradict Bible's teaching in Ephesians 2:20 which says that the church's foundation is the apostles and prophets, not Peter alone. They posit that the meaning of Matthew 16:18 is that Jesus uses a play on words with Peter's name to say that the confession he had just made is the rock on which the church is built. There is no biblical or historical evidence for the claims of the Roman Catholic church that Peter was the first pope. In fact there is no evidence that there even was a pope in the first century. Even Catholic historians recognize this as a historical fact....We honor Peter and in fact some of our churches are named after him, but he was not the first pope, nor was he Roman Catholic. If you read his first letter, you will see that he did not teach a Roman hierarchy, but that all Christians are royal priests. Partial support for the Catholic position comes from Oscar Cullmann. He disagrees with Luther and the Protestant reformers who held that by "rock" Christ did not mean Peter, but meant either himself or the faith of His followers. He believes the meaning of the original Aramaic is very clear: that "Kepha" was the Aramaic word for "rock", and that it was also the name by which Christ called Peter. The New Apostolic Church believes in the re-established Apostle ministry. It sees Peter as the first Chief Apostle in the Early Church. Chrysostom says thus: "Upon this rock," not upon Peter. For He built His Church not upon man, but upon the faith of Peter. But what was his faith? "Thou art the Christ, the Son of the living God." And Hilary says: To Peter the Father revealed that he should say, "Thou art the Son of the living God." Therefore, the building of the Church is upon this rock of confession; this faith is the foundation of the Church. " All of the arguments Roman Catholicism brings to set Peter up as the first Pope are done only to uphold its false teaching which says that people are saved, not by Christ's saving alone, but also by the deeds of penance they do. It is this teaching, which Roman Catholicism says has been taught by Popes ever since Peter, which also gives us the reason for the way Roman Catholicism interprets Mt 16:18. "And upon this rock I will build my church." Upon what rock? Peter? Upon a man? No, not upon a man, upon the rock of revelation, the thing which they were talking about. He had just said, "... flesh and blood hath not revealed it unto thee, but my Father which is in heaven." This revelation that Jesus is the Christ is the foundation upon which he would build his Church. Jesus in His teachings says, "Upon this rock I will build my Church, and the gates of hell shall not prevail against it." What rock? Revelation. It is important to note that although these quotes may represent normative LDS belief, none of them are from canonized doctrinal sources . The LDS Church therefore has no official doctrinal interpretation of Matthew 16:18 in this respect. ^ Walter A. Elwell (editor), Evangelical Dictionary of Theology (Baker Academic 2001 ISBN 978-0-80102075-9), entry "Peter, Primacy of"
^ Theodore Stylianopoulos "Concerning the Biblical Foundation of Primacy", in Walter Kasper (editor), The Petrine Ministry (Paulist Press 2008 ISBN 978-0-80914334-4), pp. 43–44, citing John P. Meier, A Marginal Jew. 3. Companions and Competitors (Knopf Doubleday 2001 ISBN 978-0-38546993-7), pp. 221–225, and others. ^ "For Peter was probably in fact and effect the bridge-man (pontifex maximus!) who did more than any other to hold together the diversity of first-century Christianity. James the brother of Jesus, and Paul of Tarsus, the two other most prominent leading figures in first-century Christianity, were too much identified with their respective "brands" of Christianity, at least in the eyes of Christians at the opposite ends of this particular spectrum. But Peter, as shown particularly by the Antioch episode in Galatians 2, had both a care to hold firm to his Jewish heritage—which Paul lacked—and an openness to the demands of developing Christianity, which James lacked. John might have served as a figure of the center holding together the extremes, but if the writings linked with his name are at all indicative of his own stance, he was too much of an individualist to provide such a rallying point. Others could link the developing new religion more firmly to its founding events and to Jesus himself. But none of them, including the rest of the twelve, seem to have played any role of continuing significance for the whole sweep of Christianity—though James the brother of John might have proved an exception had he been spared." [Italics original] Dunn, James D.G. The Canon Debate. McDonald & Sanders editors, 2002, ch. 32, p. 577. ^ "Cephas - Dictionary.com - Reference.com". Dictionary.reference.com. Retrieved 2013-07-18. ^ In French, the translation, "Tu es Pierre, et sur cette pierre je bâtirai mon Église, et les portes de l'enfer ne prévaudront point contre elle preserves exactly the play on words in what is believed to be the original Aramaic. ^ a b c Veselin Kesich (1992). "Peter's Primacy in the New Testament and the Early Tradition" in The Primacy of Peter. St. Vladimir's Seminary Press. pp. 61–66. ^ Schatz, Klaus. Papal Primacy: From Its Origins to the Present. Translated by John A. Otto and Linda M. Maloney. Collegeville, MN: The Liturgical Press, 1996. p. x. ^ "Cathecism of the Catholic Church". Vatican.va. Archived from the original on 2012-06-23. Retrieved 2012-07-22. ^ Pelikan, Jaroslav (1959). The Riddle of Roman Catholicism. New York: Abingdon Press. p. 78. ^ Bevenot, Maurice. St. Cyprian: The Lapsed, The Unity of the Catholic Church. pp. 6–8. ^ Giles, E., ed. Documents Illustrating Papal Authority: A.D. 96-454. London: S.P.C.K., 1952. p. 6. ^ Giles, E., ed. Documents Illustrating Papal Authority: A.D. 96-454. London: S.P.C.K., 1952. p. 8. ^ Giles, E., ed. Documents Illustrating Papal Authority: A.D. 96-454. London: S.P.C.K., 1952. p. 9. ^ Giles, E., ed. Documents Illustrating Papal Authority: A.D. 96-454. London: S.P.C.K., 1952. p. 4. ^ Giles, E., ed. Documents Illustrating Papal Authority: A.D. 96-454. London: S.P.C.K., 1952. p. 23. ^ Giles, E., ed. Documents Illustrating Papal Authority: A.D. 96-454. London: S.P.C.K., 1952. pp. 29-30. ^ Giles, E., ed. Documents Illustrating Papal Authority: A.D. 96-454. London: S.P.C.K., 1952. p. 53. ^ Giles, E., ed. Documents Illustrating Papal Authority: A.D. 96-454. London: S.P.C.K., 1952. p. 126. ^ Giles, E., ed. Documents Illustrating Papal Authority: A.D. 96-454. London: S.P.C.K., 1952. p. 163. ^ Giles, E., ed. Documents Illustrating Papal Authority: A.D. 96-454. London: S.P.C.K., 1952. p. 175. ^ Giles, E., ed. Documents Illustrating Papal Authority: A.D. 96-454. London: S.P.C.K., 1952. p. 182. ^ Giles, E., ed. Documents Illustrating Papal Authority: A.D. 96-454. London: S.P.C.K., 1952. p. 194. ^ Giles, E., ed. Documents Illustrating Papal Authority: A.D. 96-454. London: S.P.C.K., 1952. p. 198. ^ Giles, E., ed. Documents Illustrating Papal Authority: A.D. 96-454. London: S.P.C.K., 1952. p. 323. ^ Morris, Colin. The Papal Monarchy: The Western Church from 1050 to 1250. Oxford: Clarendon Press, 1989. p. 101. ^ Morris, Colin. The Papal Monarchy: The Western Church from 1050 to 1250. Oxford: Clarendon Press, 1989. p. 129. ^ Morris, Colin. The Papal Monarchy: The Western Church from 1050 to 1250. Oxford: Clarendon Press, 1989. p. 133. ^ Giles, E., ed. Documents Illustrating Papal Authority: A.D. 96-454. London: S.P.C.K., 1952. p. 297-321. ^ Logan, F. Donald. A History of the Church in the Middle Ages. New York: Routledge, 2002. p. 133. ^ Schatz, Klaus. Papal Primacy: From Its Origins to the Present. Translated by John A. Otto and Linda M. Maloney. Collegeville, MN: The Liturgical Press, 1996. p. 100. ^ Logan, F. Donald. A History of the Church in the Middle Ages. New York: Routledge, 2002. p. 297. ^ Veselin Kesich (1992). "Peter's Primacy in the New Testament and the Early Tradition" in The Primacy of Peter. St. Vladimir's Seminary Press. pp. 67–90. ^ ’’Apostolic Teaching and Constitutions’’, Book 7, Chapter XLVI – "Who Were They that the Holy Apostles Sent and Ordained?" ^ Veselin Kesich (1992). "Peter's Primacy in the New Testament and the Early Tradition" in The Primacy of Peter. St. Vladimir's Seminary Press. pp. 47–48. ^ ’’On Christian Doctrine’’ Book I. Chapter 18.17 ‘’The Keys Given to the Church’’. ^ ‘’The Prescription Against Heretics’’:Chapter XXII.-Attempt to Invalidate This Rule of Faith Rebutted. The Apostles Safe Transmitters of the Truth. Sufficiently Taught at First, and Faithful in the Transmission. ^ Veselin Kesich (1992). "Peter's Primacy in the New Testament and the Early Tradition" in The Primacy of Peter. St. Vladimir's Seminary Press. p. 68. ^ "PETER IS THE ROCK (This Rock: January 1998)". Catholic.com. Archived from the original on 2011-07-26. Retrieved 2012-07-16. ^ "Who is the Rock?". Users.stargate.net. Archived from the original on 2012-02-16. Retrieved 2012-07-16. ^ a b "Peter the Rock". Catholic Answers Magazine. October 1999. Archived from the original on 2016-06-01. Retrieved 2012-07-22. ^ "Peshitta Aramaic/English Interlinear New Testament" (PDF). Retrieved 2012-07-22. ^ "Matthew 16:18 - Peter, This Rock". WELS Topical Q&A. Wisconsin Evangelical Lutheran Synod. Archived from the original on 27 September 2009. Retrieved 16 Mar 2017. ^ "Responses to previous questions..." WELS Topical Q&A. Wisconsin Evangelical Lutheran Synod. Archived from the original on 27 September 2009. Retrieved 16 Mar 2017. ^ "Treatise on the Power and Primacy of the Pope". Book of Concord. Retrieved 2012-07-16. ^ Gawrisch, Wilbert R. (5 Aug 1991). "The Doctrine of Church and Ministry in the Life of the Church Today" (PDF). Wisconsin Lutheran Seminary. Archived from the original (PDF) on 2015-02-03. Retrieved 4 Feb 2015. ^ Balge, Richard D. (6 June 1995). "Cross-Cultural And Multicultural Ministry In The New Testament" (PDF). Wisconsin Lutheran Seminary. Archived from the original (PDF) on 2015-02-03. Retrieved 4 Feb 2015. ^ Eckert, Harold H. "The Specific Functions of the Church in the World" (PDF). Wisconsin Lutheran Seminary. Archived from the original (PDF) on 2015-02-03. Retrieved 4 Feb 2015. ^ "And On THIS ROCK I Will Build My Church..." WELS Topical Q&A. Wisconsin Evangelical Lutheran Synod. Archived from the original on 27 September 2009. Retrieved 16 Mar 2017. ^ "New Testament Student Manual". LDS Church. Retrieved 31 Mar 2016. ^ [https:www.lds.org/manual/teachings-joseph-smith/chapter-16 "Chapter 16: Revelation and the Living Prophet"]. Teachings of Presidents of the Church: Joseph Smith. LDS Church. Retrieved 31 Mar 2016. "Who is the Rock of Matthew 16:18?". Retrieved June 21, 2005. "Commentary on Matthew 16:17–19". The Catholic Evangel. Archived from the original on 2009-10-26. Retrieved June 21, 2005. "Section IV: Authority". Refutation of James G. McCarthy's 'The Gospel According to Rome'. Retrieved June 21, 2005. Chadwick, Henry. The Church in Ancient Society: From Galilee to Gregory the Great. Oxford: Oxford University Press, 2001. Collins, Paul. Upon This Rock: The Popes and their Changing Roles. Melbourne: Melbourne University Press, 2000. Evans, G.R. The Church in the Early Middle Ages. I.B. Tauris: New York, 2007. Maxwell-Stuart, P.G. Chronicle of the Popes: the Reign-by-Reign Record of the Papacy from St. Peter to the Present. 2nd ed. London : Thames & Hudson, 2006. Perkins, Pheme. Peter: Apostle for the Whole Church. Columbia: University of South Carolina Press, 1994. Pham, John-Peter. Heirs of the Fisherman: Behind the Scenes of Papal Death and Succession. New York: Oxford University Press, 2004. Winter, Michael M. Saint Peter and the Popes. Baltimore: Helicon Press, 1960.